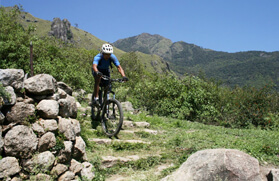 Mountain biking is certainly one of the best adventure sports available in Sikkim. 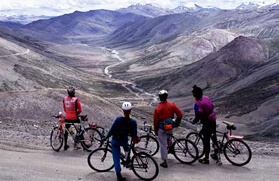 The spectacular and rocky land of Sikkim Himalayas offers various enthralling biking tracks to adventure enthusiasts. The beauty and charm of Sikkim, its flora, fauna, culture and lifestyle can be best explored by riding a bike through thriving dales and green hills. Sikkim has been listed among the famous tourist destinations of India across the globe because of its natural beauty as well as this exciting new adventure activity. There is no particular season for mountain tour in Sikkim. Every season, except July and August offers different fun and adventure to the bikers. 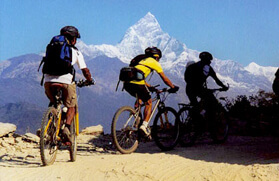 At Trekking in India, we can arrange Mountain Bike Tours in Sikkim that can best suit your time frame and interest. 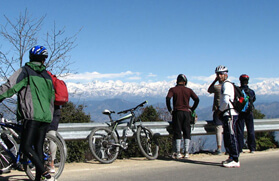 Our Sikkim Mountain biking tour is an eco friendly and exciting way of exploring the real beauty of Sikkim. Starting our mountain bike tour in Sikkim from Bagdogra, we will take you to Gangtok - Phedang - Singhik - Chungthang - Lachung - Yumthang - Lachen - Thangu. On the way back to Gangtok, you will visit beautiful Bhutia and Subba village, the Phensong and Phodang Monasteries. Our tour will end at Bagdogra. 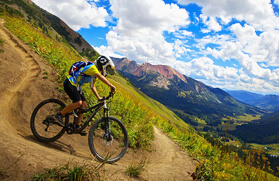 Travelling such long miles by riding mountain bikes can make your journey more challenging and adventurous. The stunning landscapes, beautiful countryside and wilderness offer a daring challenging to the mountain bikers who wants to closely witness the typical culture & tradition of the people of Sikkim. 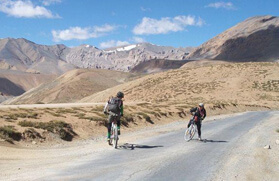 If you wish to ride a mountain bike on a dirt road, difficult tracks and closely view the scenic countryside, then the Sikkim Mountain biking holidays is what you need. After reaching the Bagdogra airport you will meet the Peak Adventure Tours representative and drive towards the capital of Sikkim "Gangtok". We will stop at Rangpo (Sikkim & Darjeeling Border) for scrutiny the Passport/Documents and VISA. After reaching Gangtok, check-in to the hotel and have some rest. Later by the evening you can ride your bike in the nearby region of your hotel and get become accustomed. We will be staying overnight at the hotel. Today, after the breakfast in the morning, meet our representative and after the detailed briefing, begin your biking excursion in the direction of Martam Village by way of the Rumtek Monastery and Rani Khola. We will visit the prominent Rumtek Monastery; it is the largest and illustrious monastery in the region of the Eastern Himalayas, Rumtek, is the most important seat of the Kagyupa Sect of the Tibetan Buddhism founded in the eleventh century. We will be staying overnight in the village. After having breakfast in the morning, we will take a ride to our destination of the day Temi. It will be a downwards trip till we reach Sirwani Bridge. Temi is identical with the Tea Garden, which is the solitary tea estate in Sikkim and is considered as the preeminent Tea gardens. The 'Temi Tea Garden' is spread in an extensive area covering an area of about 435 acres on a moderate hill slant along the thoroughfare. It also touches the bottom of the famous Tendong Hill located in the West Sikkim. The Temi Tea Garden has also made its prominent mark in the Tea markets globally. This garden produces the premium quality of tea, which is known for its superb taste that is combined with aromatic fragrance. We will stay overnight at the hotel. In the morning you can visit the spectacular Temi Tea Garden for seeing how tea is produced from the leaves. Afterwards, begin your biking excursion to Ravangla. It is a relaxing trip all the way through Damthang. On the way, you can explore and visit the Ravalang Monastery. This Monastery was built after the 4th Chogyal's pilgrimage, as per the records. After his comeback, the Karmapa executed (Rabney) the blessing. Some grains that he tossed from the Tsurphu Monastery in Tibet fell on the land of Ralang, which was seen by the devotees. It is the same site where today the Ralang Monastery is standing. The work of the renovation in the monastery was carried out by the Govt. in the year between 1975 -81. The historic Ralang Monastery a sanctified and is one of the most noteworthy Sikkim based monasteries that follows the Kagyupa tradition. We will be staying overnight in a guest house. After having wholesome breakfast in the morning, we will begin the ride in the direction of Tashiding. On this day, it will be a moderate ride which will go downward to a small town Legship. We will be staying overnight in a guest house. Today, in the early morning we will visit the Tashiding Monastery. It is quite an illustrious monasteries and is positioned about 40 kilometers far from Ravangla. This Monastery was built in the year 1716. "Bumchu", a popular annual festival is celebrated in this monastery. The main highlight of the festival is the opening the sacred pot filled which contains holy water. The water level of the pot seen while opening the pot indicated the coming year and how it is going to be. We will be staying overnight at the hotel. After having wholesome breakfast, start off your ride and head in the direction Pemayangtse. It is a stable ascending ride towards Pemayangtse that takes you to an upright descent into the Rimbi Valley. While on the way, you can visit the sanctified Khichepheri Lake. We will witness and pass through the pictorial gorge, murmuring waterfalls, extensive farmland and dense forest on the way. We will be staying overnight at the hotel. After having healthy breakfast in the morning we will visit the Pemayangtse Monastery and afterwards we will drive on the way to Darjeeling "Hill Queen of the W. Bengal'. After reaching the destination you will check in to the hotel. We will be staying overnight here at the hotel. In the early morning, we will drive towards Tiger Hill to for an incredible experience of the first very rays of the sun over the spectacular Himalayas. After returning back, we will visit the Ghoom Monastery. This Monastery was built in 1875 and follows the Gelugpa sect. The monastery houses and preserves one of the largest effigies of the Maitreya Buddha "The future Buddha". After having wholesome breakfast, we will drive towards the Darjeeling Railway Station which is (10 min) away and ten take the exciting joyride on the well-known heritage toy train up to Ghoom. After reaching the Ghoom Railway station get on to your motor vehicle and visit The Himalayan Zoo where you will find numerous Himalayan fauna, for instance, black bear, snow leopard, the Red Panda, tigers, yaks, etc. in their natural environment, and then we will visit the neighbouring Himalayan Mountaineering Institute (a leading training centre for mountaineers) and a museum detailing the gradient of the Mt. Everest by Sir Edmund Hillary & Tenzing Sherpa and various other major mountaineering expeditions. We will also visit the Tibetan Self Help Centre, a centre where training is provided to young people in the detailed and intricate art of the famous Tibetan handlooms and handicrafts. Here, the sales emporium is open for a certain time of the day to the visitors to purchase the souvenirs. We will be staying overnight in the hotel. After having the breakfast, we will drive towards the Bagdogra airport and board the scheduled flight for the onward destination from here.